The definitive work on using INCRA Tools. This 148 page book contains detailed plans with over 400 illustrations and photos to build 14 of Perry McDaniel's intriguing original projects. Printed in U.S.A. Sorry, the Project Book is not directly compatible with metric INCRA Fence Systems. Written by INCRA expert Perry McDaniel, "Projects & Techniques" features step-at-a-time plans more than a dozen original projects and 11 special techniques sections that will turn you into a real INCRA pro. This 148 page book contains detailed plans with over 400 illustrations and photos. As an added bonus, FREE templates are included for making the spectacular INCRA Double-Double Through Dovetail and INCRA Corner-post Eagletail. Includes clearly written instructions for each variation. Note: Although the techniques described are valuable for all INCRA systems, the project plans are not in metric format and the additional templates are not compatible with metric INCRA fence systems. 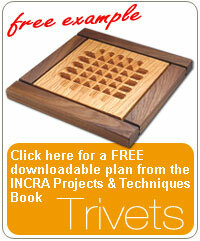 Save a Tree and money with INCRA's New Paperless Project Book! Easy to follow instructions will show you how to download the book step-by-step. Shop Now! Recommended internet browser IE 6 and up.